Tuna salad never looked so fresh! 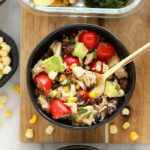 Make this colorful healthy tuna salad recipe with a Mexican twist using black beans, cherry tomatoes, corn, and cilantro. Salad week continues with all things TUNA SALAD. 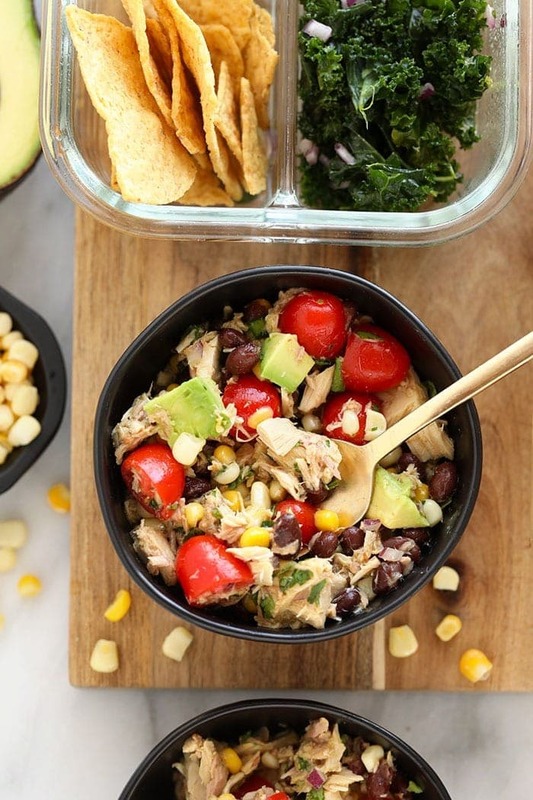 Today we are sharing a delicious fiesta tuna salad that is packed with protein, veggies, and healthy fats. We can’t wait for you to meal prep it for the week! 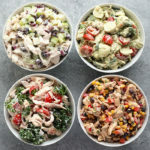 We’re big fans of cold salads and more specifically, ones that are both protein-packed and can be put together in less than 10 minutes! 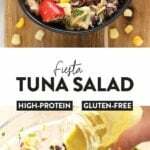 Our avocado tuna salad, for example, is another one that’s thrown together in under 10 and same with our classic healthy tuna salad recipe. 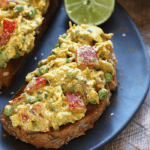 Both of these recipes use the same featured ingredient — canned tuna, which is an excellent healthy and quick protein option. A 5 oz. can of tuna (in water) has more than 20g protein, 0g carbs, and 1g fat. Hells to the yes! You can use any kind of canned tuna, but we prefer white Albacore tuna in water. It tastes the freshest and has the best texture! 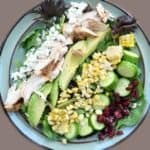 Tuna salad is an excellent meal to meal prep for the week because it’ll last you a few days in the fridge and goes great with so many other things! Here are some commonly asked questions about tuna salad. How many days is tuna salad good in the refrigerator? 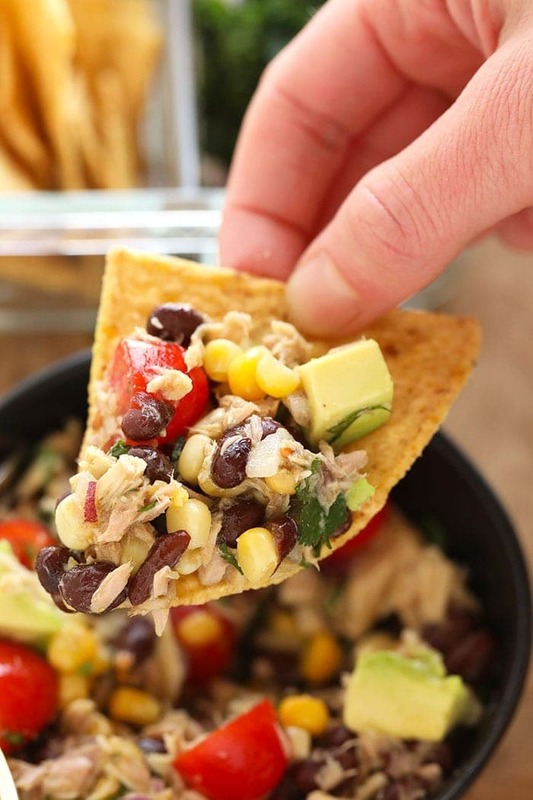 This fiesta tuna salad will last you around 3 days in the refrigerator. Just make sure to seal it in an air-tight container such as THESE ones. What goes with tuna salad? Is tuna bad for you? 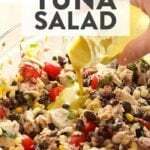 Tuna salad is NOT bad for you! If you make our tuna salad without mayo, it’s packed with protein and lower in carbohydrates and calories. 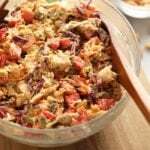 How to store tuna salad? 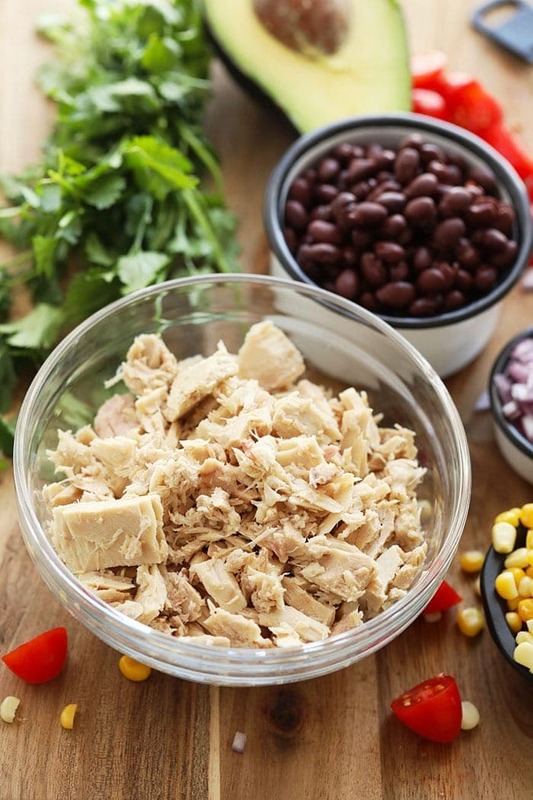 We suggest storing your fiesta tuna salad in a glass meal prep container in the refrigerator. We love this bento box version and this single meal prep container the best! 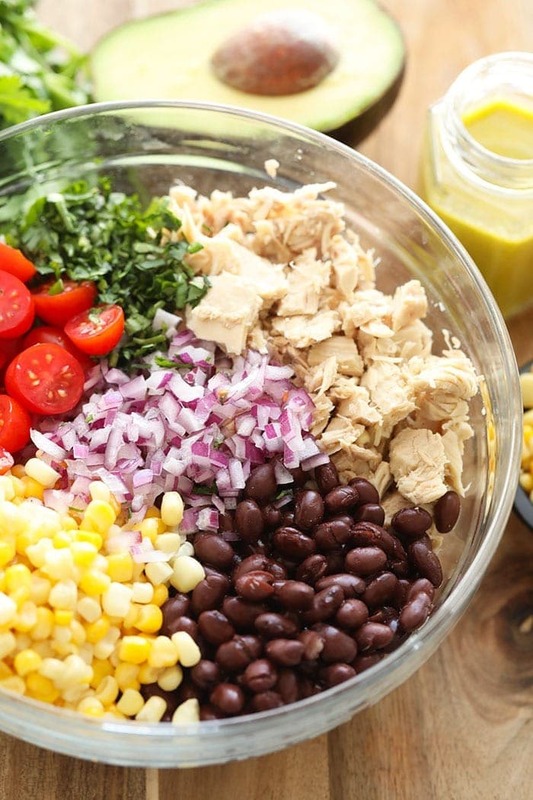 Start by adding all of the ingredients for the fiesta tuna salad into a large mixing bowl. Mix well and set aside. 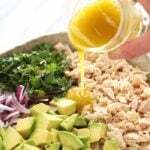 Prepare the tuna salad dressing by placing all ingredients for the dressing into a mason jar. Tightly cover the mason jar, and shake until all ingredients are combined. 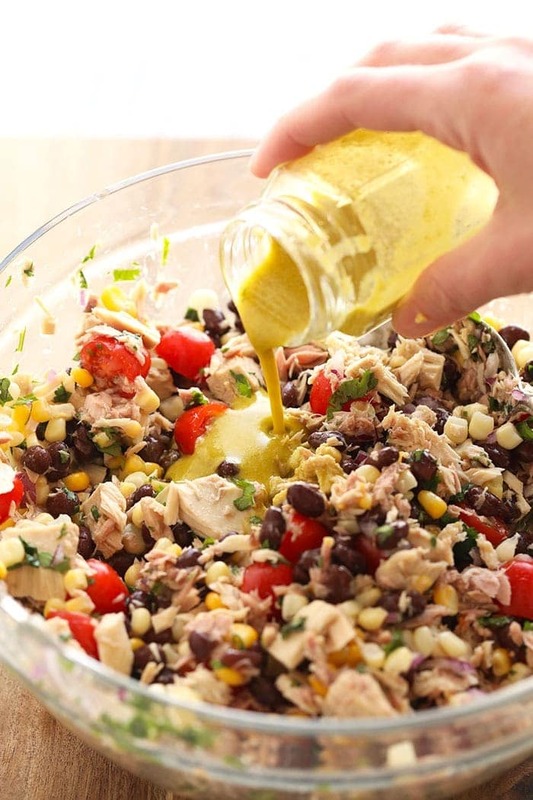 Pour fiesta tuna salad dressing over the tuna mixture and mix until combined. 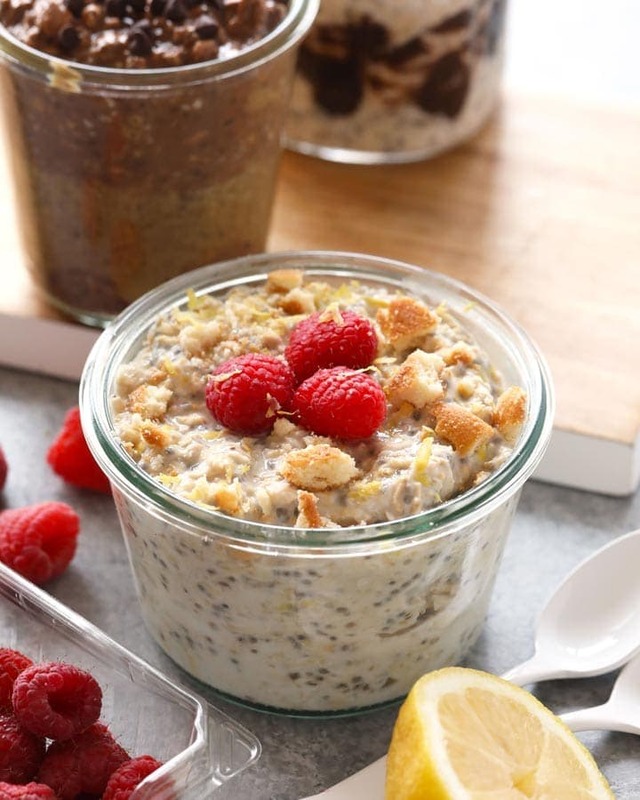 Eat immediately or store in the refrigerator for up to 5 days.